With a low-maintenance composite deck built by our team at Mid-Atlantic Deck & Fence, there is no need to worry about chilly temperatures, winter precipitation, or storm damage threatening the structural integrity of your deck. As we approach the holiday season in Maryland, it is time to prepare for our state’s infamous, unpredictable winter weather. However, with a low-maintenance composite deck built by our team at Mid-Atlantic Deck & Fence, there is no need to worry about chilly temperatures, winter precipitation, or storm damage threatening the structural integrity of your deck. As you prepare the rest of your home for chilly winter months in Maryland, consider the many reasons why your composite deck is perfect for withstanding winter weather. Unlike the maintenance required for a traditional wood deck, there is no need to worry about chilly temperatures causing your composite deck material to split and crack through the season. Because your new deck is made of resilient and non-porous composite materials, the temperatures should have almost no effect on your deck during the winter months. Your low-maintenance composite deck is also resilient against freezing rain and snow during the winter storms in Maryland. While you should always sweep excess snow off of your deck to relieve your deck of the weight following a storm, there is no need to worry about a little snow or freezing rain in the upcoming months. While a traditional wood deck can be a classic addition to your home, a low-maintenance composite deck can easily give you the best of both worlds. With minimal maintenance in cold temperatures and inclement winter weather, you can rest assured that your deck will withstand the worst of the season in Maryland. Like any other decking material, it is important to inspect your composite deck in between seasons for any potential issues. However, with a durable composite decking material, these issues should be minimal, if any. Enjoy a High-Quality Composite Deck this Year! Mid-Atlantic Deck & Fence has almost 30 years of experience in building beautiful custom fences, gazebos, screened-in porches, and decks throughout the state of Maryland. 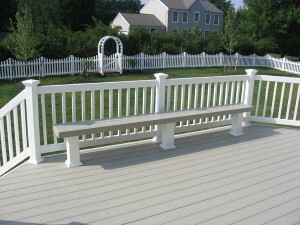 We have the expertise to design your dream fence or custom deck and have it installed in a headache-free process. Give us a call at 1-800-833-9310 or visit us online for a quote today! We offer many different styles of fencing and decking in addition to custom options designed specifically to suit your preferences and tastes. To see examples of our work and get more tips on how to choose the right decking for your family, follow us on Facebook, Twitter, Houzz,Pinterest, Google+, and YouTube.